Every Tuesday I post a work of art I love priced under $10K. This week: when I browsed images of Grant Falardeau's current show at Hilde Gallery in Los Angeles, I just couldn't get this one out of my head. Is it because it reminds me a little of a George Condo sculpture, but with an affordable price tag... maybe! But is that a bad reason? If you're interested in seeing more, please get in touch! Every Tuesday I post a work of art I love priced under $10K. This week: I'm loving the delicate beauty of these ceramic sculptures by Ursula Morley Price from her current show. If you're interested in taking a look in person, please get in touch -- the exhibit is up through Friday! Every Tuesday I post a work of art I love priced under $10K. This week: I am infatuated with Liz Robb's soft sculpture. They're gorgeous, and it's so interesting to follow her travels on Instagram to watch her experiment with natural materials and dyes. If you're interested in considering a piece by Liz for your home, please send me a note! Every Tuesday I post a work of art I love priced under $10K. This week: If you can't get enough of that Ettore Sottsass postmodernism (and if you haven't seen the awesome show at Met Breuer, you should! ), take home an Oeuffice object today! I love these limited edition inlaid ziggurats that stand about 20 inches tall. Super chic! Every Tuesday for the past year, I have posted on my website and to social media, a work of art I love priced under $10,000. I find it rewarding to work with collectors who set a $10,000 annual budget and buy one piece a year, slowly building a thoughtful and meaningful collection over time. That said, if I counted on my under-$10,000 clients, I would not be able to earn a living as an art advisor. However, working with art at this price point is a way for me to give back to the art community. In light of art market trends that have made it increasingly difficult for low to mid-market galleries to stay in business, support of emerging artists and artists whose works sells at a lower price point is particularly important right now. A shocking number of galleries have recently shuttered, including in the past two years in New York: Andrea Rosen, CRG, Feuer/Mesler, Kansas, Lisa Cooley, Lombard Fried, Mike Weiss, Mixed Greens, Robert Miller, and Tracy Williams. Sarah Douglas writing for Artnews, calculated that between 2012 and 2015 only 12 galleries closed, while since 2015 the number skyrocketed to 46, including 31 in the past year. These closures and the financial pressures faced by all but the biggest galleries are getting headlines in art publications and even in The New York Times. The articles blame growth of the international mega galleries (like Gagosian, David Zwirner, and Pace) alongside the increasing draw of the “trophy” artists they show. They also point to the breakneck speed of the nearly annual global art fair calendar and the rising rents in gallery areas like West Chelsea. I agree that these are significant factors in today’s art market, but I would like to suggest that both could present an opportunity rather than a problem. First, yes — the value of artwork is often fetishized. Just about the only time the Contemporary art world gets a non-art publication headline is when a breath-taking price is achieved at auction. Art as commodity seems to grab interest over content and meaning. Although there’s been some pearl clutching about this journalistic phenomenon, I find it a source of hope. If thinking about dollars and cents catches attention in a way brushstrokes do not, then fine. My hope is that reading about a record price achieved for, say, a Basquiat, will lead the reader to turn to someone like me—an art advisor—to inquire what she could own that fits in her budget. There are plenty of people who can spend $10,000 or $50,000 a year, and there is nothing they can afford at Gagosian. The issue is reaching these collectors. So, second, love them or hate them, art fairs across the world are packed, drawing people from many walks of life. And, with approximately 270 art fairs around the globe each year, there are 200 more than there were a decade ago. Fairs, however, are a huge financial gamble for a gallery. The starting price for a small booth at a second-tier fair, can be as much as $10,000 (and note, a big booth at a top drawer fair, can cost as much as $100,000). To do an art fair, a dealer must also pay for booth extras (walls and lights at a minimum), shipping the art, and airfare and hotels for staff. Undertaking these risks is often necessary to get work by your gallery artists in front of art-buying eyes. As an art advisor, art fairs are invaluable tool for me. My clients are busy people for whom art buying is a secondary priority. As much as I know they enjoy looking at art with me, it often takes a backseat to professional and family demands. Since I have a hard time scheduling in-person viewing time with my clients, being able to show them a huge variety under one roof within a few hours is amazing. They can learn so much about what they like and what is available quickly. My clients often make multiple purchases in an afternoon that would have taken months with digital images and gallery visits. However, the less expensive the art work a gallerist sells, the harder it is to undertake the expense of an art fair. And, because galleries are taking on such tremendous costs, they are less likely to show work by their younger unproven artists, or artists whose pieces are at a lower price point. The less a gallery is paying in rent, the more they can risk on an art fair, showing less expensive work by younger artists. I think dealers like Sasha Wolf (of Sasha Wolf Projects) and Candice Madey (of On Stellar Rays) have it right. They both closed their ground floor gallery spaces in favor of office showrooms so they have the time and resources to focus on art fairs and other one-off projects. For galleries I see the shift from a permanent brick and mortar location to art fairs to be an opportunity. The day-to-day staffing of a retail space is a drain on time and resources, and so often during the 10am to 6pm gallery day, there is not a single set of eyes taking in an exhibition. 65,000 pass through the Armory Show every year and over 70,000 visit Art Basel Miami Beach. It may be a four day exhibition, but the reach is far beyond what most galleries bring in for a show. By paying less rent every month, a dealer can do more fairs and take advantage of some to show riskier or less well-known and less expensive work. So, why is this important? Sales allow artists to make art. Full stop. The value for me in promoting less expensive artwork is twofold. First, the ability for artists to earn a living by selling works of art allows their artistic practices to flourish. It is hard to make good work when you are an artist-slash-whatever and your studio time is tucked into evenings and weekends. Like any creative or philosophical pursuit, creating art requires time and concentration to pursue an idea and connect one thought to another. Second, I believe that living with good art—regardless of the cost—improves life, broadens perspectives, and stimulates thought. When a client tells me that they spend time every day with a piece I helped them purchase, I am thrilled. I hope that my “Tuesday under Ten” series helps people to think of art as something attainable rather than aspirational. Some of my clients do not have six-figure art-buying budgets, but that doesn’t mean they can’t live with wonderful works of art. Every Tuesday I post a work of art I love priced under $10K. This week: I adore everything about this editioned tabletop di Suvero sculpture. Visually, it's has this great tribal industrial feel. But it's so much more than that. If you've ever seen one of di Suvero's huge outdoor sculptures, you might have noticed that they often have at least one beam that extends toward the ground that tempts viewers to climb aboard. And, in fact, the artist intended for people to mount his sculptures -- which sometimes include moving parts -- and use them as rides! How spectacularly fun is that? So, when people were agitated in 2011 about Occupy Wall Streeters climbing on di Suvero's Joie de Vivre, which lives in downtown Manhattan, they were completely misguided. But public art doesn't have all the fun in di Suvero's body of work! This small steel sculpture can be taken apart and put back together in a variety of ways. I love art that asks you to interact, and I think it would be amazingly fun to own and play with this piece! Please get in touch if you're interested. Every Tuesday I post a work of art I love priced under $10K. This week: Did you know that after an art auction it's often possible to make a private offer for a piece that didn't sell? It's one of my favorite ways to get great prices for my clients (and for myself!). Rago has taken it one step further and is offering unsold lots in a public online auction. I think nearly everything is under $10,000, including this super cool Lichtenstein sculpture! There is a zero percent chance of rain on Saturday, and I have spring fever! One of my favorite activities is walking around Chelsea, checking out the latest gallery shows. I totally recommend it! Here's a few to catch. Every Tuesday I post a work of art I love priced under $10K. This week: I adore Cindy Hsu Zell's rope sculptures. A master of the art of gravity, Zell makes the rope in each piece by hand. Art doesn't have to be a picture in a frame, and I'm super into fiber art right now! Get in touch if you would like to hear more textile ideas for your home. Every Tuesday I post a work of art I love priced under $10K. This week: there is a great show of new Halsey Hathaway paintings at Kristen Lorello Gallery! The overlapping shapes are a lesson in color theory (blue + pink = purple, etc. ), and the play of light, color, and geometry means there is so much to explore in these pieces. I'm a huge fan! If you would like to visit the gallery with me to see them in person, please get in touch! As a bonus, they are beautifully paired with Julia Kunin's ceramic sculptures that have the most gorgeous metallic Hungarian glazes! Every two years, The Whitney Museum puts on an large exhibition called the Biennial. It's a big deal because the show is known for encapsulating what's now and what's next. 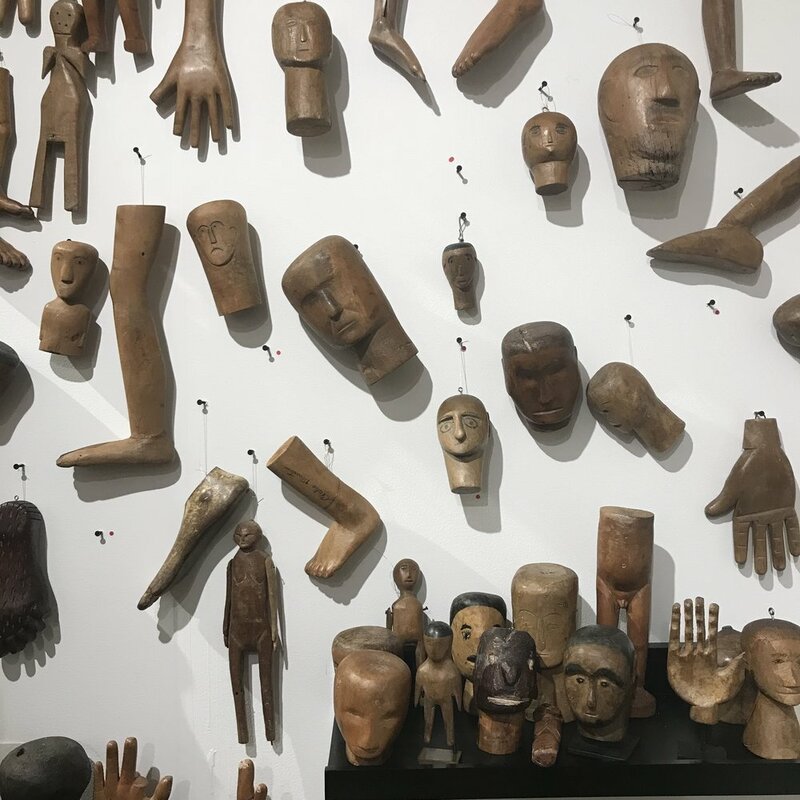 If you want to know what is driving artists today, and what the art world is going to be talking about tomorrow, a visit to the Biennial can help -- even if a lot of the work is not your cup of tea visually. Most editions exhibit many emerging artists, and inclusion can catapult an artist's career to the big league. The Biennial began in 1932, making it the longest-running show of its kind for American art. This -- the seventy-eighth edition -- is the first in the new Meat Packing District building. The focus of many of the 63 included artists, perhaps not surprisingly, is on racial and economic inequality and political tension. Here are some highlights! This gorgeous Keith Haring vase was auctioned off at Bonhams in London last week. With equal parts ancient world and street art, Haring made a masterpiece out of this readymade vessel!